Not working for me under Win7 x64 on RX480 8GB, installation completes but after rebooting and trying to open Radeon Settings the window gets stuck on the task bar, if i try to mine using those drivers Claymore Eth 9.8 crashes almost instantly… going back to 17.7.2 makes everything work again. @etayorius Which drivers are best to use for Polaris cards? I thought 16.12 was the newest one could use for claymore. @EtaYorious had same issue with Win7, Installed win10, works fine. Got it to work on Win7 x64, but not through the official “Crimson Relive For Blockchain Compute”. What i did was to FULLY install 17.7.2, then got the Leaked Beta Drivers and force their installation through Device Manager and apply the patch OVER 17.7.2. It is Working perfectly now, i was getting 24.4 Mh/s and went back up to 27.3 Mh/s. You might want to get the leaked drivers for Win7. 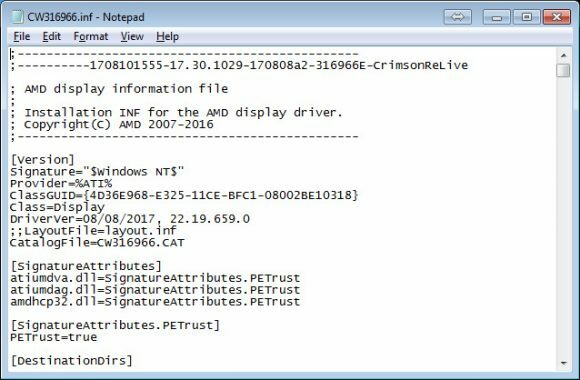 did you try install 17.7.2 and force amd official win7 beta driver instalation through Device Manager ? Btw the large increase value of BTC started to ponder me and I noticed that in recent months food prices in stores increased by 30%, would the great crisis come and fall the value of the dollar? Will the US government start like always a war to cover up this? Will they attack in Syria or North korea first? Yupi, I installed 17.7.2 and installed “Leaked Beta Dag Fix”, not the official Blockchain Compute ones. Just google and download the “Leaked Beta Dag Fix Drivers” and use the instructions in there, then force install those ones into 17.7.2 through Device Manager. Random Dude, any recent driver will work fine with Polaris, but if you want to get some lost hashrate back due to the Dag Epoch increasing in size just install 17.7.2 and then download and the “Leaked Beta Dag Fix” drivers, force install those ones into 17.7.2 Device manager and then apply the patch provided with the Leaked Beta Dag Fix. Just installed the official beta today on a mixed RX 5 card rig, a 480’s, 3-470’s and a 4 gig 460, all cards un-tweaked and un-modded. Just followed AMD’s uninstall procedure (did not use DDU) and then installed the driver. hash rate had been fluctuating a lot with and average of 91 mhs. After the install it is running at 111 mhs with very little fluctuations in my hash rate. If it continues like this I may attempt to tweak the voltage and clock rates some to see if I can get it a little higher yet. Happy so far, hope they come out with the beta Linux driver for my Linux rig soon. I was getting crazy with Win7 x64 and Claymore Dual Miner – all it gave for my RX 580 is 23.5 MH/s w my extreme BIOS and overclock. This was with latest adrenaline drivers or crimson relive (not blockchain). However I’ve downloaded latest crimson relive blockchain drivers (v. 17.30) – and you’d thought they fix Win7 issue after 5 months – but no, same problem as first poster w RX 480. Thank god for “Leaked Beta Dag Fix Drivers” – now I’m getting 29.8 MH/s! I have Gigabyte Redeon RX480 8 GB and try many time to install AMD Blockchain Crimson Compute driver but it does not work for long….. It does get installed fine and start mining with increased hashrate but it gets hang after 10 15 min and stop mining again until restart windows 10. and then i have to get back with Compute driver and with low hashrate. Is there anyone has solution to get high hashrate on my device?